The story of Africa in the last century is one characterized by action and response. It was a century in which Western actions towards Africa were met with an African reply, and vice-versa. In the ensuing socio-cultural-political struggles, no African leader’s philosophic premise was more visible in showcasing Africanity than the late Tanzanian President Julius Kambarage Nyerere. It is now nearly 30 years since he peacefully relinquished political power through his Chama Cha Mapinduzi party (an achievement in itself) and 15 years since the curtains came down on his illustrious existence. How best as young learners and scholars alike, do we situate his immense contributions to humanity? To begin with, Nyerere made us conscious of the vocabulary of language as a window into the universe of knowledge of its speakers and their view of the world around them. Words are taken as a label of aspects of culture, he would often say, adding that they are thus an index of the cultural world of society. His statement - “One should live so that in dying one can say: I gave all my strength for the liberation of humanity”. And “our role is to transform our societies and to give content to human dignity” – gives us a deep inception and clarity to the humanistic basis of his Ujamaa philosophy. For me, Nyererean philosophy, if I can call it that, is one punctuated by modest dreams of freedom of which he endeavored to sidestep as well as to demolish the allure of the nation-state and the false prerogative of progress in Africa – somehow echoing Dr Walter Rodney’s classic How Europe Underdeveloped Africa (1973), or Professor Rene Dumont’s False Start in Africa (1962) and Professor David Basildon’s Black Man’s Burden: Africa and the Curse of the Nation-State (1992). All these classic texts examined the formation of modern African states. And argued, contrary to popular opinion that pre-colonial African states existed with the capacity to integrate themselves organically into the global order on their own terms. Professor Davidson, for instance, dwells extensively on the Asante nation-state to illustrate the vibrancy of the pre-colonial states and concludes that “this organic process would have led to a much more positive end but it was aborted by the invasion of Africa by Imperial powers (driven partly by greed and partly by a racist worldview) and the subsequent imposition of “alien” political structures, completely divorced from, and hostile towards “traditional” African institutions and society. 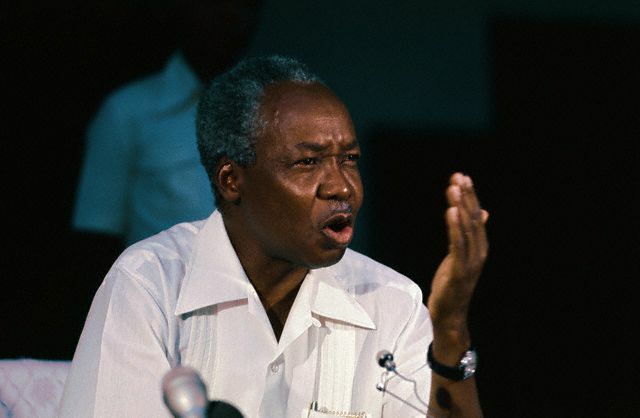 The conjectural basis of Nyerere’s philosophic work stressed the importance of sociolinguistic, social capital as well as tacit knowledge in connection to culture. Any learner or scholar for that matter, that takes Nyerere’s Ujamaa premise seriously has no option but to start the task of deconstructing and reconstructing the imaginary supremacy of Western intellectual experts who behave like priests by issuing universal prescriptions of philosophy. In Ujamaa, the Western tradition of shutting out every emotion, intuition, sentiment in the name of objectivity has been found to not only be merely inadequate and unrealistic, but factually in error. For no human being, no great thinker has succeeded, or can succeed, in doing all these since that would mean his stopping to be human. The Mtu ni Utu concept teaches us of the significant value of emotion in role of thinking. Thinking, it is argued, involves using all of human faculties: imagination, intuition, and sentiment come into play, no matter how dispassionate and strict a thinker we may try to be. As a transdisciplinary learner and instructor, Nyerere’s conscientious support as the first Chancellor of the University of Dar es Salaam, later referred to as the ‘Dar Salaam School’- for its vigorous social sciences and radical approach towards humanities that cultivated a homegrown intellectual arsenal, stands out as the most significant feat among many of his other social, cultural and political achievements. For those who knew him, Nyerere’s quest for unity both nationally and continentally was a lifetime undertaking and commitment. “Unity was the lifeline for the emancipation and development of the African people”, he would often say. The University managed to attract the attention of scholar activists from all parts of the world, some of whom included the famous Dr Walter Rodney whose book How Europe Underdeveloped Africa is still compulsory reading for most Africa programmes in universities across the word. Dar also attracted a number of other scholars of significant reputation, chief among them the late Dani Nabudere, whom I had the pleasure of working closely with until his sudden death in November 2011. Professor Nabudere used Nyerere’s Ujamaa platform in the 1970s and early 80s to launch his artillery towards the underlying characteristics of the epistemological and methodological texture of Western sciences in their dealing with the non-Western world. Dethroning condescending Western language and cultural views and placing Africans centre-stage in the history of the continent was perceived as an urgent task not only by Nabudere, but by many other scholars inspired by Nyerere’s vision in Africa and in the diaspora, who constructed an intellectual arsenal aimed at liberating and decolonizing the African mind. Books such as Imperialism in East Africa (1977), followed by Pan Africanism and Integration (2002) as well as Afrikology, Philosophy and Wholeness (2011) are some of Nabudere’s work in point that were in part inspired by Nyerere’s judicious ideas of the community. Other writers, Cheik Anta Diop‘s Precolonial Black Africa (1974) and East Africa’s godfather of the written word Ngugi wa Thiongo’s Decolonizing the Mind (1986), were (among many others) publications that also aimed at advancing Nyerere’s ambition of reinstating the African intellectual memory. Nyerere will forever be remembered for pushing and spearheading the growth of Kiswahili in East and Central Africa, which epitomized his belief that Kiswahili could promote African unity, just as it had done in Tanzania. He gave content and meaning to Tanzania`s independence by recognising the role of an indigenous language in the development of cultural authenticity and national unity. To him, pan-Africanism meant self-determination in political, economic, ideological, social and cultural spheres. Today, out there in the margins, demands for new theories of freedom, expanded definitions of Ujamaa inspired Mtu ni Utu philosophy, sharpened understandings of the notion and practice of justice as well as understandings of context, diversity, difference and culture continue to emerge from discredited coffins of modernization and other western paradigms. As British political sociologist Frank Furedi puts it: ‘paradoxically, the more the world becomes internationalized, with every region brought into an intimate relationship with the world market forces, the more the singularity of the experience of the parish-pump is insisted upon’. We do well to remember Mwalimu Julius Nyerere as a relentless Africanist who sought the unity of communities with a passion and cared about everyone everywhere. Or, as once summarized by Jacob Zuma, the South African president; his philosophy “taught the world about peace, democracy and unity, laying the foundation for Africa to start its long and arduous road towards peace and unity”. His death in October 1999, coincided with the time I was making preparations to begin my undergraduate studies in Political Science in England, where he died. At the time of his death at London’s St. Thomas Hospital, he was reportedly busy translating The Republic by Plato into Kiswahili as he lay in bed; he went through the manuscript, made the necessary corrections and completed them before he died. He was a keen reader, a dedicated philosopher, and, in spite of his illness (leukemia – that eventually killed him), a prolific writer. Ronald Elly Wanda is a cultural animator and a trans-disciplinary scholar based in Taveta, Kenya. His Twitter handle is elly_wanda.